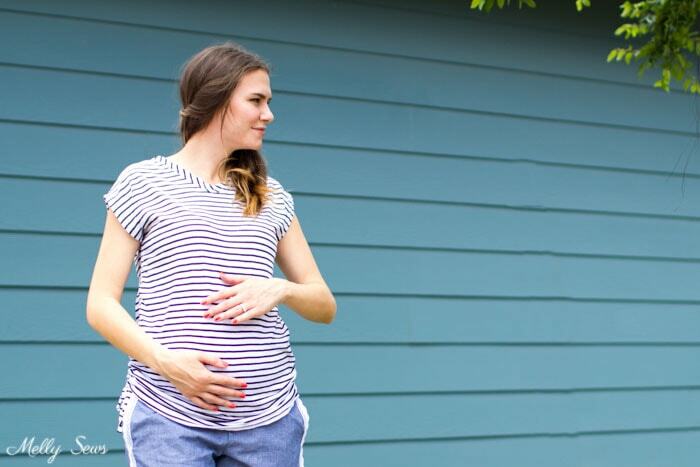 Hey y’all, as promised on Tuesday today I’ve got the post about how to make this maternity t-shirt, which is adapted from my free Blanc T-shirt pattern. You can see Tuesday’s post about how to make these maternity shorts. You know you hear about the glow of pregnancy? Well I didn’t feel like I glowed (too sick) but I think my lovely former student is definitely glowing. 1-2 yards of knit fabric, depending on size. Though the regular Blanc can have woven fabric on the front, you don’t want to do that with maternity; this needs to be all knit fabric. Ties or ribbon for the ruching. You can make these out of self fabric as I did; I cut 1 inch wide pieces of knit and then fold both raw edges toward the center then added a coverstitch to keep those edges from unfolding. If you don’t have a cover stitch, twin needle or even zig-zag works just fine too. 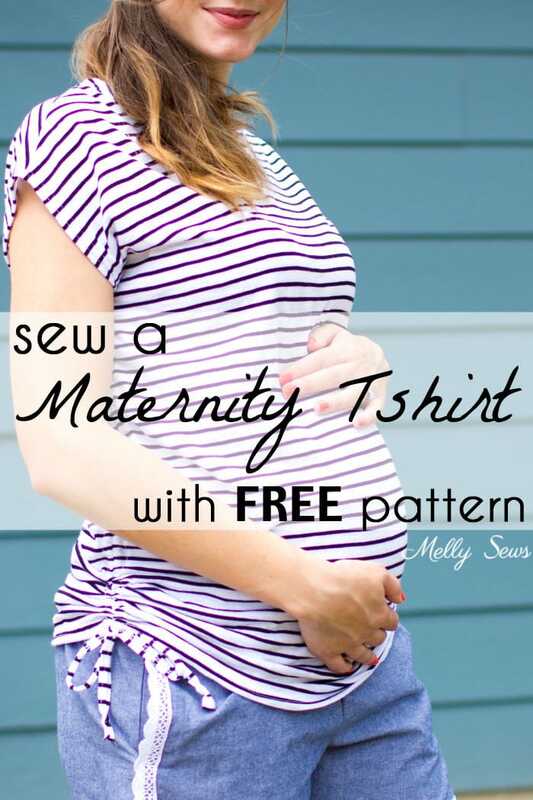 Next, go read this post about modifying patterns for maternity wear. Follow the instructions to modify the front pattern adding both width and length, and then add the same amount of length (but not width) to the back pattern piece. Follow the instructions in the Blanc pattern to sew the shoulder seams BUT sew the side seams with a 5/8 inch seam allowance. 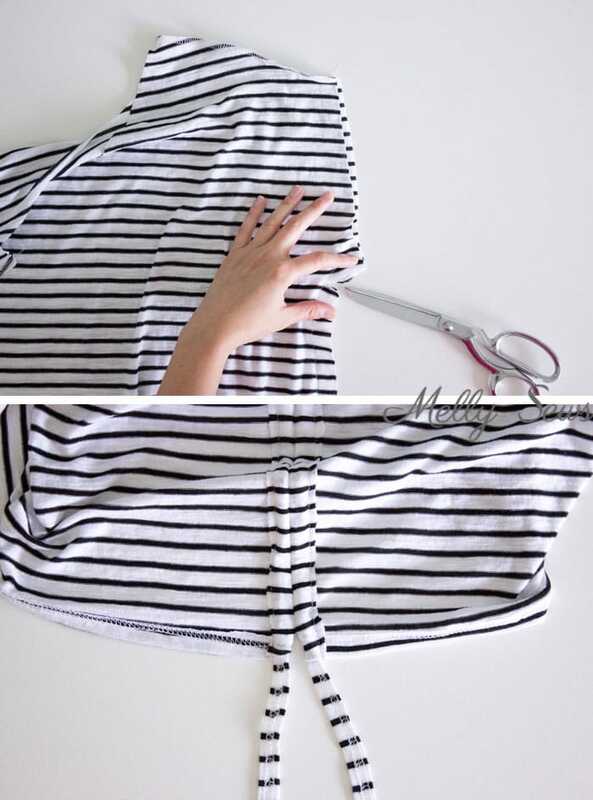 Follow the pattern instructions to hem the sleeves and bottom of the shirt and finish the neckline. Then clip into each armscye curve as shown below. Press the side seams open and stitch the edges down to form two casings up to the underarm. Thread the ties or ribbons through the casings up to where you clipped the seam, then sew across the ties at the underarm to secure them and make sure they don’t pull out. Tie knots in the ends of the ties, then pull to adjust.